POD will be shipped in 10 Days. 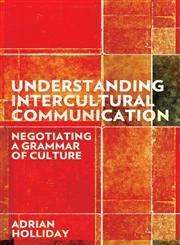 The Title "Understanding Intercultural Communication Negotiating a Grammar of Culture" is written by Adrian Holliday. This book was published in the year 2013. The ISBN number 0415691303|9780415691307 is assigned to the Paperback version of this title. This book has total of pp. 208 (Pages). The publisher of this title is Taylor & Francis Group. We have about 156516 other great books from this publisher.